1 I, Paul, myself entreat you, by the meekness and gentleness of Christ—I who am humble when face to face with you, but bold toward you when I am away!— 2 I beg of you that when I am present I may not have to show boldness with such confidence as I count on showing against some who suspect us of walking according to the flesh. 3 For though we walk in the flesh, we are not waging war according to the flesh. 4 For the weapons of our warfare are not of the flesh but have divine power to destroy strongholds. 5 We destroy arguments and every lofty opinion raised against the knowledge of God, and take every thought captive to obey Christ, 6 being ready to punish every disobedience, when your obedience is complete. 7 Look at what is before your eyes. If anyone is confident that he is Christ’s, let him remind himself that just as he is Christ’s, so also are we. 8 For even if I boast a little too much of our authority, which the Lord gave for building you up and not for destroying you, I will not be ashamed. 9 I do not want to appear to be frightening you with my letters. 10 For they say, “His letters are weighty and strong, but his bodily presence is weak, and his speech of no account.” 11 Let such a person understand that what we say by letter when absent, we do when present. 12 Not that we dare to classify or compare ourselves with some of those who are commending themselves. But when they measure themselves by one another and compare themselves with one another, they are without understanding. My wife and I go to an inner-city church on Sunday nights to teach an Awana Bible study program to the kids. It has been an interesting process. The theme verse that they repeat every week is 2 Timothy 2:15 Do your best to present yourself to God as one approved, a workman who does not need to be ashamed and who correctly handles the word of truth. That is so foundational to any study of the Bible. It grounds many important truths. “Do your best” — That is a phrase I wouldn’t necessarily expect to see in the Bible. It obviously doesn’t mean to do your best to save yourself, as that is impossible. It is all up to Jesus. But we are commanded to do our best to properly handle the word of God. Think of how we do our best in so many other areas: Tests at school, projects at work, hobbies, sports, etc. We spend hours of hard work and deep thought to do our best. Yet we can get very sloppy when approaching the word of God. Do we really do our best to handle it correctly? “present yourself to God” — Yes, the audience of one is paying attention to how we treat his word. He cares if we handle his word accurately or not. “a workman” — Yes, it is work. Eternally satisfying work, but work. “does not need to be ashamed” — So mishandling God’s word would be something to be ashamed of? Yes. “correctly handle” — There is a way to correctly handle God’s truths. It isn’t a free-for-all where everyone gets their own special revelation. “the word of truth” — It is indeed the word of truth. Beware of those who claim the name of Christ yet deny that. Also see 1 Thessalonians 2:13 And we also thank God constantly for this, that when you received the word of God, which you heard from us, you accepted it not as the word of men but as what it really is, the word of God, which is at work in you believers. The Awana program seems pretty solid. It is mainly geared to young kids, though my youngest daughter did it for a couple years in high school and got a lot out of it. I find it a little heavy on memorization relative to context, but I realize that young kids have spongy brains and that it is a prime time to get them to remember these verses (schools should overhaul what they teach at different ages, such as learning languages in the early years, but that’s another topic). I was thrilled one night when they were told about Philippians 4:13, a commonly misunderstood verse. I was able to explain what it really meant, and the kids seemed to get it. I pray that they will go through life getting that verse right the first time and sharing the great news of it with others. P.S. Here are the Powerpoint slides to one of my all-time favorites lessons on reading the Bible in context. I have gotten verses wrong many times — including all the examples in the presentation — so it is a lesson I never want to forget. I am a mixed bag on time management. Some things I do really well, which creates plenty of time to do a variety of things. But then I’ll waste some of it because I’m not prioritizing well. And by “waste” I don’t mean that it is bad to just do nothing sometimes and rest. I mean that I end up doing things that aren’t that important, like TV or Internet surfing. How is your time management? Remember that if you aren’t doing what you say you want to do (Bible study, prayer, family time, reading, exercise, volunteering, etc.) it is because you consider that the least important thing you actually do is more important than the things you say you want to do. You may not have those conscious thoughts, but it is an accurate assessment. In other words, if you are not reading your Bible and praying daily it is because you have decided not to. A couple of tactical things help me: The O-H-I-O (Only Handle It Once) approach to emails and tasks works well when I use it. Instead of going over a message multiple times when I’m not sure how I want to handle it, I try to deal with it the first time (respond, file, etc.). On the flip side, knowing when to carefully analyze a situation to anticipate consequences saves a lot of time at work. As I like to say, I don’t like to overkill things but I do like to kill them. By that I mean that I want to get it done right the first time and not have to waste time later because a “shortcut” left someone out of a communication loop. Sometimes you have to “brake to go faster.” The discernment to know when to do it is the key. Consider these words then try this exercise by Randy Alcorn. The New Testament speaks the same message: “Redeem the time,” or “Make the most of every opportunity” (Colossians 4:5b). In high school, kids who have taken math their entire lives still have a huge range of classes depending on aptitude and experience. It ranges from basic math to AP Calculus. In church high school classes, it is typically a one-size-fits-all approach, even lumping multiple grades together. Some kids have been well-educated theologically their entire lives and some are new to the faith. So we have a huge range of high school classes for kids who have had life-long training, and a narrow range of spiritual classes for kids who have had a much wider range of training. Keeping the kids together for many lessons and activities is fine, but it is inevitable that some kids will be bored by lowest-common denominator material (like mine were, which is why they joined another church) and some will find the material too difficult. My youngest started attending an adult class at their new church with some of her friends. It was amazing. I’ve had the opportunity to visit myself and I love it. The teacher spent three years in 1 Peter, which at first glance sounds like a recipe for disaster. Yet the class grew and grew and attracted people who wanted meaty lessons because he was so thorough and meaningful. She would come home every week talking about the lesson. I’m grateful that she had the opportunity to join the class. One of the reasons churches may lose post-high school kids is that there isn’t a stable place to study. They can’t go to the high school classes any longer, and the young adult / college classes are too transient to be meaningful. So why can’t kids with an interest go to adult classes? Are there any Bible verses against parents learning with children? If we expect high school students to learn algebra, Shakespeare, biology, etc., why do we have to dumb down the Bible for them? Note: I would make the distinction that we should have smaller age / experience appropriate groups (i.e., Mothers of Pre-Schoolers, accountability groups, etc.) where people can share and interact. In this post I am speaking of basic Bible studies. * Reminder: Sunday School has a purpose, but parents still have the primary responsibility to teach their children. The problem is that most are biblically illiterate. They just take kids to church and hand the responsibility off to someone else. If they actually read the Bible they’d know they were shirking their responsibilities. 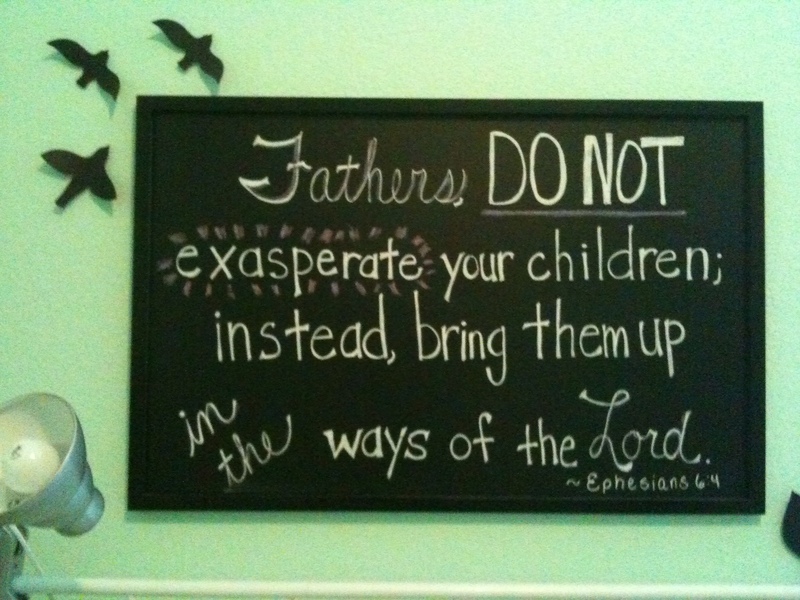 Ephesians 4 Fathers, do not provoke your children to anger, but bring them up in the discipline and instruction of the Lord. That’s my youngest daughter’s life verse, by the way, though she prefers the translation that says not to exasperate your children (she likes to tease me by saying, “You’re exasperating me!”). In case you think I’m kidding, this is a picture of her bedroom wall. I’m glad my kids both kept a keen sense of humor! Habakkuk 3:17 Though the fig tree should not blossom, nor fruit be on the vines, the produce of the olive fail and the fields yield no food, the flock be cut off from the fold and there be no herd in the stalls, 18 yet I will rejoice in the LORD; I will take joy in the God of my salvation. 19 GOD, the Lord, is my strength; he makes my feet like the deer’s; he makes me tread on my high places. Update: The music leader read this during service the next Sunday. That was a nice coincidence! I was surprised to see a study group on something called Renovare’ being offered at a local church. I scanned the book they are using (The Good and Beautiful God: Falling in Love with the God Jesus Knows) and it looks pretty creepy. Lots of stuff implying that God will reveal special, individualized messages to you in prayer. He could do that, of course, but I’ve read a bit of the Bible and can’t think of a single passage that hints at that being normative or something we can get on demand. The “still, small voice” was audible — and was given to an Old Testament prophet who had just slaughtered a few hundred prophets of Baal after a dramatic showdown. So if you fit that job description, you too can expect audible messages from God! One exercise from the book has you read a passage then note any word that “God seems to be emphasizing.” Then you “allow God to reveal to you the significance of this word.” This is bad on many levels. Aside from being un-biblical, it will lead people to think they aren’t really Christian or aren’t as spiritual as others because they don’t get personalized messages from God. Or people will make up some meaning that isn’t there and just fashion a god in their own image. Or they will feel peer pressure to make up something (hey, lying is always good for spiritual growth, right?). There was lots on lectio divina in the book as well. Maybe if we just read the 31,173 verses in context and really sought to understand them via normal Bible study techniques we’d be better off. God seemed to be keen on getting what He wanted into the Bible, so perhaps those drawn to lectio divina and Renovare’-type practices should make sure they have all those verses well understood before expecting God to give them something new and personalized.